Buyer beware: this book is in the French language. Not English! 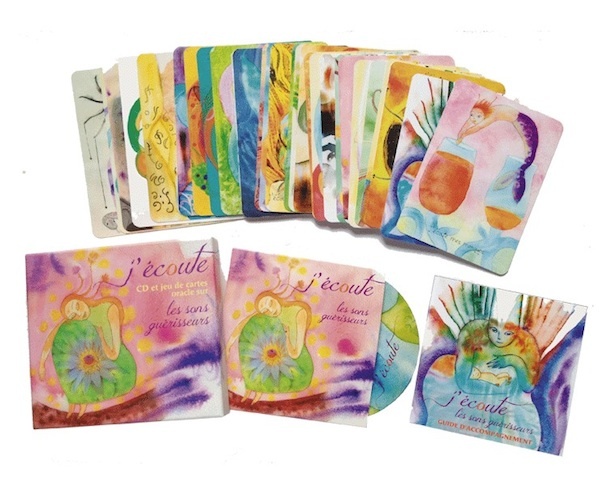 French Import – The power of sound associated with oracle cards. J’écoute, (I Listen) combines the power of images, sounds and words. This is an innovative project that uses the power of sound, color and feelings. This is the first time a card game combines the eye, the ears and inner listening. The box is composed of 30 oracle cards (10x14cm), CD 15 tracks (77 min) and a 32-page booklet. Each card is associated with a text or a song, it invites us to listen to ourselves, to her inner beauty and to open up to the beauty of this world. This box emerged after a year of work of Prikosnovénie & Mandalia-music staff. Sabine Adelaide is the Fairyesque Illustrator, Frédéric Chaplain, the pen and ear, Arnö Pellerin the instruments sound specialist. 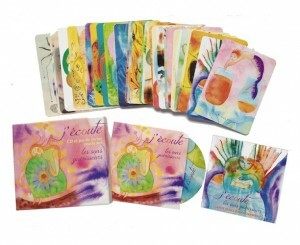 This Box Set CD+cards is for anyone sensitive to zen music, games oracle cards (angels oracle…). For anyone interested in the welfare and relaxation.